Nail Art Ideas : Ever growing advancement in beauty industry has brought in fashion for nail art too. Metallic colours on nails are recent trendsetters along with chrome and mirror effect. Anyone who is creative and has some fancy thoughts can create a wonderful nail art which is trendy for the day. The best effect is achieved if you use silver powder on a black base gel polish. For chrome effect you can use other base gel lacquers the best being white and pink. Chrome powder is easy to apply and it can be done at home by anyone. 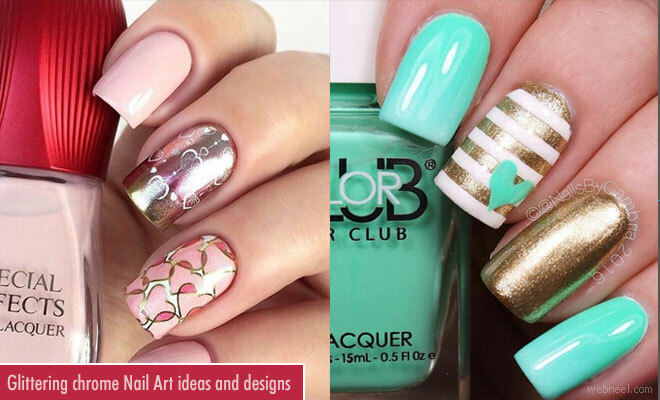 These nail art ideas are handy and can increase your fashion quotient in every aspect.